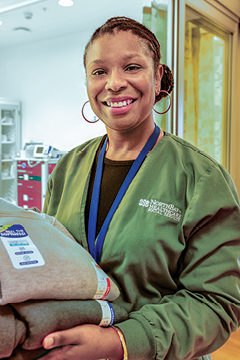 Denise Lanier, a medical social worker at NorthBay Medical Center, holds a change of clothes for patients who might not otherwise have them. Unfortunately, not every NorthBay Healthcare patient has a safety net in place to capture them after they are discharged from the hospital. Some are homeless, living on the financial edge or lack family support. When NorthBay nurses and physicians learn of these predicaments, some help is available. Funds come from employee donations, either through payroll deduction or a one-time donation. NorthBay Healthcare matches every dollar, Yolanda explained. Funds are used primarily to assist with discharge medications, or home equipment for the uninsured or under-insured, or to purchase clothing for our homeless or trauma patients. Several times a year, Yolanda restocks a supply space with sweatshirts and sweatpants in winter and shorts and t-shirts in the summer, as well as socks and hats — with money from the fund. Donations for the H.E.R.O fund come from staff but also members of the community. Anyone wishing to donate to this, or any other NorthBay Healthcare service — such as the Cancer Center, NorthBay Hospice or the Neonatal Intensive Care Unit — may direct the donation to NorthBay Healthcare Foundation, 4500 Business Center Drive, Fairfield, CA 94534. Place a note about where you would like the funds to be directed on the memo line, or call (707) 646-3131 for information. NorthBay also has an agreement with some local pharmacies and specific durable medical equipment companies to accept our H.E.R.O fund vouchers, so that patients can receive their needed discharge medications or home equipment. H.E.R.O funds are also used to purchase bus tickets, gas cards, and taxi rides home or to follow-up medical appointments. “We don’t give out cash, just the vouchers,” she noted. H.E.R.O fund money has also been used, in certain circumstances, to re-establish utilities for patients who’ve had their phone or gas shut off, or to pay back rent.